I'm due to write the sequel to Life and Death on the Farm Part 1 but I’m afraid I need to insert another chapter. No sooner had I blogged about the shame of losing a chick to a tomcat than we had a much bigger worry on our hands. I apologise that this is a much longer blog that usual but I think it’s worth explaining the story in detail. We check in on all our animals morning and evening, even if we have no need to feed them. Late one afternoon, just before we were due to go out to a vernissage at the art gallery in our village we were doing the rounds. Gabrielle had vigilantly spotted that all was not well with one of our ewes. She had her head down, was separated from the others and didn’t come over to eat, classic symptoms that all is not well with one’s sheep. We’d recently bought a second-hand dog transport box from our friend Renée (who runs a pet boarding, care and relocation business). As our sheep are tiny, they fit comfortably inside the dog box, enabling us to transport them without needing to put them in a trailer. We phoned the vet to tell them I was on way with a poorly sheep and Gabrielle, following a whirlwind scrub up and change of clothes, cycled off to the gallery. Dr Hamadi Mouhli is a wonderful chap: calm and efficient, realistic yet optimistic and always with a friendly smile. 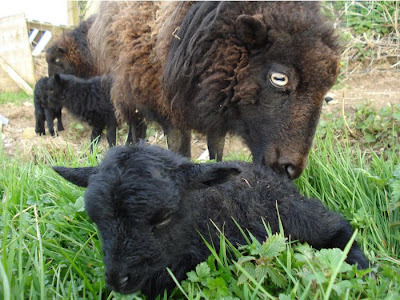 He quickly established that the ewe was running a temperature and had a swollen half-udder and teat, she had mastitis. 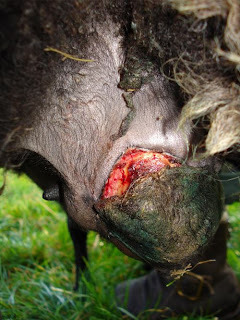 He gave her three injections: an anti-inflammatory analgesic, then intramuscular antibiotic and, following an emptying of the udder, expressing bloody milk, another antibiotic straight into the affected teat. He gave me an additional two treatments for the teat and explained again what I needed to do. He also gave me, for free, an electronic thermometer, what I now realise is an essential item in the stockowner’s toolkit. By the time I got home, the ewe was already perking up, the effects, no doubt, of the pain and fever relief rather than the antibiotics. She was not out of the wood yet though and two days later, when I’d finished the short antibiotic treatment, she was no better, the teat was hot, although her body temperature was normal and she was inflated and solid along the length of her belly. I spoke to the vet on the phone. He invited me to come in and he’d give me a balm to sooth her udder (which he poured some out of a large bottle and didn’t charge me for) and three packets of a powder to give her for the oedema (the swelling was due to fluid retention). Two days later and we were still concerned. Another phone call and this time he offered to come to us. Although her body temperature was normal, things had got worse in her udder. He gave her another two injections—one each of anti-inflammatory analgesic and antibiotic—and then explained the likely course of events. She now had gangrene in the half of the udder—which sounds horrendous—but the udder is isolated from the rest of the body and the udder would eventually fall off and the wound scar over (This photo shows this process beginning). We could save the animal but not her udder, no more lambs for her. Dr Mouhli gave me the bottle of antibiotics, a syringe and four clean needles and instructions on how to give intramuscular injections. He explained how I should stretch her head over my knee then locate myself relative to a bone below her throat, her shoulder bone and the ligament running along her neck. Aiming now for the middle of this triangle, I would be assured of finding muscle. Teasing the hair apart I would push the needle in almost all of its length (he’d supplied appropriate needles) and then squeeze. After, I should rub the muscle to distribute the antibiotic, whilst cooing, “there, there, all better now”. He only charged us for the bottle of antibiotic and not for the callout or consultation, as he happened, so he said, to be in our area at the time. Each day, we’d gently catch the ewe, I’d inject her with her medicine and we’d take her temperature, inserting the new thermometer up her sheepy bottom and leave it there until it went beep; 39ºC is the normal body temperature of a sheep. She’d finished her treatment, her temperature was normal but when I checked in on her one afternoon she was looking very sorry for herself. We wondered whether we’d lost the battle and how much more we should put her through. I’d even spoken to our pig-farming neighbour Paul on how we could dispose of her body. Another phone call to the vet, who suggested that she was just in pain (you might imagine how painful it is to have a part of you turn gangrenous and fall off) and invited me to come in for more medicine. Really busy, he apologised for rushing me but gave me the end of a bottle of anti-inflammatory analgesic and several needles, along with instructions on how to administer this subcutaneously: a different technique altogether, involving pulling he skin into a tent and then piercing it once to inject into the void beneath the tented skin. This was also for free! She perked up quite promptly but sagged again before each daily injection. After three days, I judged it appropriate to wait until she seemed to need relief before administering any more medicine. She now shows no further sings of distress even though the udder had started to separate from her body (see photo above) and we keep her sprayed with blue antiseptic (which I usually manage to stain my fingers with) to avoid secondary infections and dissuade maggots. The photo shows how she is today, including blue make-up. She is clearly much better and eats like a horse—well, at least a very hungry sheep—and was even, for reasons unknown to Gabrielle and I, prancing around the field in the four-legged way young lambs do, even though she’s really an old lady with grey hair and some missing front teeth. People often ask us, “How do you know all this stuff?” The answer is, we don’t and I wanted to show you how it’s really possible to involve larger animals in your permaculture designs even if, like me, your stock keeping experience is limited to the childhood care of a hamster. In no particular order, you need: a good relationship with your local vet, a thermometer, a copy of a good veterinary dictionary, access to the Internet via your search engine of choice (an amazingly useful source of info, photos and diagrams) you also need to check your animals regularly and get to know your animals so you can notice, straight away, when they’re off-colour. You can also adapt, according your your own circumstances, for example, a dog transport box served us adequately in the absence of a purpose-made animal trailer. One thing we’ve learnt through this experience is that it is inevitable, if you keep animals, that you are going to lose one from time to time and that one should be prepared to accept that. 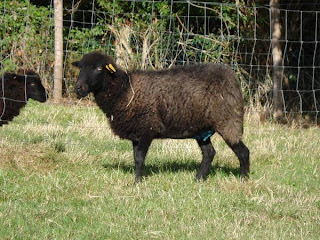 So, although we are very happy that we nursed our ewe back to a reasonable health, we’d like to register our sympathy with Val, who lost a ewe from the same disease this summer. At the end, Val was even syringing water down the poor ewe’s throat to try to keep this inert animal hydrated until she had to take it to the vet for the last time. The photo at top shows our ewe immediately after the birth of her lamb this year. I claim no great philosophical insight but the pain of nursing an animal to death pretty much balances with the joy of witnessing the loving birth of a spring lamb. I am going to kidnap your vet!!! With 25 years experience I am allowed a bottle of basic antibiotics at home and also the hardware to administer them but there is no way anyof us would be allowed anti inflammatories nor pain relief! This requires the services of the vet....who often knows less about sheep than I do! I think you are so very lucky. My vet is the best big animal practise for miles but my ewe would have survived with the care afforded by your wonderful vet. Mine had only basic antibiotics given to start with....nothing else was offered and I was told that it was not appropriate yet!!! By the time I was getting worried and they admitted her for intravenous antibiotic and anti inflamatories I was sure it was too late....and it was.....and the bill....£124! It sounds really trite, but having read James Herriot's books, i.e. All Creatures Great and Small a long time ago, I am sort of familiar with mastitis and the nasty effects thereof. The one thing I do remember, and which you have noted, is that pain is often the undoing of animals, and if that is not treated, he claimed, then the animal can close up shop for good. On the subject of sheep, their iris - do you know why they are the shape they are? Presumably they fulfil a function. the worst feeling in the world is to see an animal in pain and suffering and not be able to relieve that pain. Well done to both of you for trying, every step of the way. The outcome is never guaranteed and even if our steps are at times a little unsure every effort is appreciated. I can tell you from personal experience that having mastitis is no fun. In people, it's a lot like a really bad case of the flu with a lot of focused pain. The shape of the sheep's pupil is to give it "wide angle" vision to enable them to see predators coming. It's more complicated than that, of course, but that's the gist of it.